Whatever Masefield may have written, not of Nineveh: the city was far inland, on no river deep enough to float a six-banked ship, and was sacked long before the quinquereme was invented. It might be a poetical description of a great Assyrian ship, which might have been "rowing home to haven in sunny Palestine" (except that the name Syria Palestina was invented only in the Second Century AD). From distant Ophir? It could bring from there ivory, apes and peacocks - but it is most likely Ophir was in the Horn of Africa or India, so a ship could not sail from there to Judah or Philistia without circumnavigating Africa. Sandalwood could come from India, but cedarwood and sweet, white wine would be most readily brought from up the coast. Poetry really gets wrecked by historians and geographers. Victory's benefits and spoils of war. Are you sure you're not Richard Dawkins? He played the same trick on Keats in Unweaving the Rainbow. The man has no soul. But then he wouldn't, would he? I though it was pretty good. I am sure that the aspirant poets-in-residence on this forum could mangle Masefield quite happily with their own verses. But wallowing deep with a belly full of tea. Dreaming of fame but destined for the noose. I doubt many if any quinqueremes were used for cargo, they were designed and used as warships. Their only cargo being the 300 or so oarsmen needed for it to move and the complement of soldiers assigned to the ship for combat. 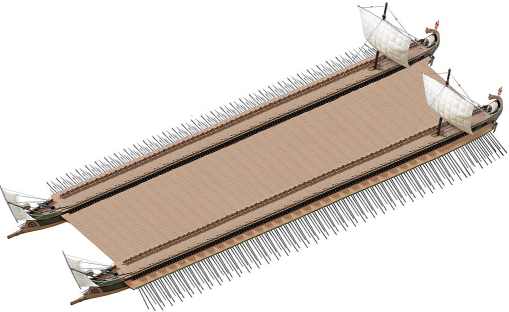 On a side note this is a proposed layout for a Tessarakonteres, a forty rowed ship. Requiring 4000 oarsmen, with 400 deckhands and 2850 soldiers making up the ship's carrying capacity. Hardly likely to have been used in combat it is viewed as something of a prestige item. Trump would order one at the drop of a hat. They will have to find volunteer loudmouth rednecks to do the rowing, since potential foreign workers are being sent away at the border.